Organs have existed in one form or another for over 2,000 years. They have inspired composers to create masterpieces, and for centuries they have inspired people to worship. The original organ installed in the Basilica of Saint John the Baptist was built by the A.B. Felgemaker Pipe Organ Company (Opus 253), of Erie PA, in 1883. There is no record of the specification for this organ. The Felgemaker organ was replaced by a Tellers Organ (Opus 302) around 1923/1924, a 3 manual, 25 stop instrument. There is no extensive information on this organ either. It was replaced with a small electronic organ, which was replaced in 1978 by two E.M. Skinner Organs: a 1913 Skinner from First United Methodist Church, Akron, Ohio, and a 1924 Skinner from Carnegie Hall, Pittsburgh, PA. The balance of the organ was acquired from various organs being disposed of, or made new for this organ. 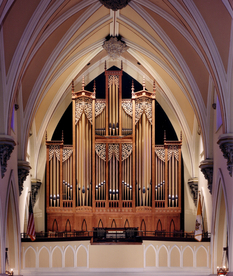 This organ served our parish for 25 years and contained 78 ranks (sets) of pipes, and had over five thousand pipes ranging from thirty-two feet in length to that smaller than a pencil. There were two, four manual (keyboards) consoles. Because the organ was not "rebuilt" before its 1978 installation, it started to show signs of deterioration within years. After several public "temper tantrums" by the organ, a committee was established to study and to be informed of what would be necessary to accomplish a restoration of our organ. An extensive Organ Committee Information Document was prepared by our Parish Organist and Director of Music to enlighten the committee before they made their decision. In 2001, the Basilica of Saint John the Baptist signed a contract with Charles Kegg of Kegg Pipe Organ Builders, (then from) Uniontown, Ohio to completely rebuild our organ. Mr. Kegg was chosen not only because of his association with our parish over the last twenty-five years, but also because of his integrity in organ building, and his high standards for craftsmanship. In January of 2004, installation of our new organ began. It was heard for the first time at the Easter Vigil of 2004. On Sunday, September 12, 2004, our new organ was blessed and consecrated. A dedication recital, played by our organist and director of music/liturgy, Robert Sullivan followed the Blessing and Consecration Liturgy. Our new Kegg Pipe Organ is one of the finest examples of pipe organ craftsmanship available today. During the planning process we knew we wanted to retain some of the stops from our previous organ, especially the many color stops (English Horn, Orchestral Oboe, Clarinet, Tuba, Neumann Trumpet, Doppelflute, etc) and Celestes (eight sets) that we enjoyed. Not only did Mr. Kegg retain these beautiful voices, but he made them more beautiful beyond our imagination. The organ now speaks clearly into the nave of the church, and has quite a presence without overwhelming the congregation. The entire organ has a cohesiveness that has surpassed our expectation. The Gothic case has also exceeded our expectation. The carvings, finials, gold facade pipes and structure are absolutely gorgeous. It compliments the style of the architecture of our Basilica so, that it seems as if it has been in place since the building was built in 1871. In addition to the organ, new choir chairs, lighting, flooring, and color monitor & camera system were installed in the gallery. 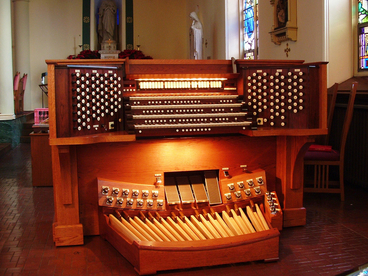 In March of 2008, the Antiphonal Organ was rebuilt by Mr. Kegg, and a 16' Pedal Stop was added. Kegg Pipe Organ Builders is located in Hartville, Ohio which is in the Northeast part of the state, close to Canton. It was establish in 1985 by Charles E. Kegg to address the needs of those institutions that desire an electric action instrument of high quality design and construction, coupled with the tonal skill and care that can only be accomplished with proper training. Mr. Kegg trained for eleven years with Schantz, Casavant, and A.R. Schopp's Sons, and is responsible for the final voicing of many Schantz and Casavant instruments ranging in size from 4 to 132 ranks. It became clear to him that there was a need in the industry for a builder of electric action instruments that were intelligently designed to bring careful chest design, pipe scaling, and voicing to a segment of the industry that frequently neglected these important steps. The goal of the company is to continue to offer uncompromising instruments at fair and reasonable costs to those organizations that desire a truly musical instrument.